PM #40762529 $5.00 • Vol. 29, No. 26 August 20, 2018 L AW TIMES C O V E R I N G O N T A R I O ' S L E G A L S C E N E • W W W . L A W T I M E S N E W S . C O M LSO seeks feedback on shrinking governing body Rebecca Durcan says that, in the course of her work, she sees 'there is a lot more distrust on the whole concept of self-regulation.' Photo: Robin Kuniski NO EXTRADITION Roma man was wanted in Romania P5 GIG ECONOMY Who is an employee in Ontario? 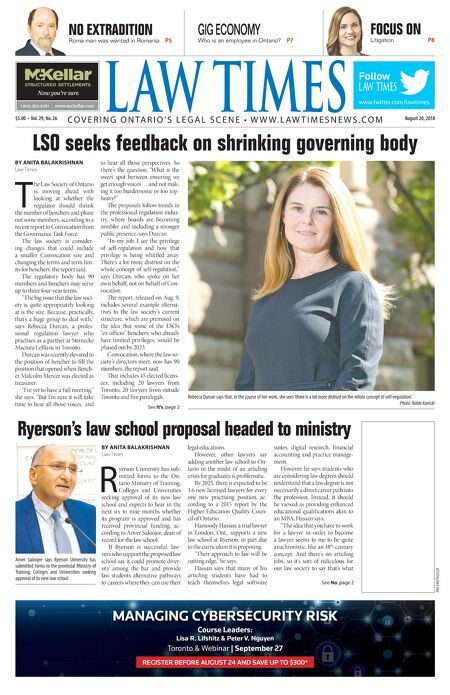 P7 FOCUS ON Litigation P8 BY ANITA BALAKRISHNAN Law Times T he Law Society of Ontario is moving ahead with looking at whether the regulator should shrink the number of benchers and phase out some members, according to a recent report to Convocation from the Governance Task Force. The law society is consider- ing changes that could include a smaller Convocation size and changing the terms and term lim- its for benchers, the report said. The regulatory body has 90 members and benchers may serve up to three four-year terms. "The big issue that the law soci- ety is quite appropriately looking at is the size. Because, practically, that's a huge group to deal with," says Rebecca Durcan, a profes- sional regulation lawyer who practises as a partner at Steinecke Maciura LeBlanc in Toronto. Durcan was recently elevated to the position of bencher to fill the position that opened when Bench- er Malcolm Mercer was elected as treasurer. "I've yet to have a full meeting," she says. "But I'm sure it will take time to hear all those voices and to hear all those perspectives. So there's the question, 'What is the sweet spot between ensuring we get enough voices . . . and not mak- ing it too burdensome or too top- heavy?" The proposals follow trends in the professional regulation indus- try, where boards are becoming nimbler and including a stronger public presence, says Durcan. "In my job, I see the privilege of self-regulation and how that privilege is being whittled away. There's a lot more distrust on the whole concept of self-regulation," says Durcan, who spoke on her own behalf, not on behalf of Con- vocation. The report, released on Aug. 9, includes several example alterna- tives to the law society's current structure, which are premised on the idea that some of the LSO's "ex-officio" benchers, who already have limited privileges, would be phased out by 2023. Convocation, where the law so- ciety's directors meet, now has 90 members, the report said. That includes 45 elected licens- ees, including 20 lawyers from Toronto, 20 lawyers from outside Toronto and five paralegals. See It's, page 2 Ryerson's law school proposal headed to ministry BY ANITA BALAKRISHNAN Law Times R yerson University has sub- mitted forms to the On- tario Ministry of Training, Colleges and Universities seeking approval of its new law school and expects to hear in the next six to nine months whether its program is approved and has received provincial funding, ac- cording to Anver Saloojee, dean of record for the law school. If Ryerson is successful, law- yers who support the proposed law school say it could promote diver- sity among the bar and provide law students alternative pathways to careers where they can use their legal educations. However, other lawyers say adding another law school to On- tario in the midst of an articling crisis for graduates is problematic. By 2025, there is expected to be 1.6 new licensed lawyers for every one new practising position, ac- cording to a 2015 report by the Higher Education Quality Coun- cil of Ontario. Hamoody Hassan, a trial lawyer in London, Ont., supports a new law school at Ryerson, in part due to the curriculum it is proposing. "Their approach to law will be cutting edge," he says. Hassan says that many of his articling students have had to teach themselves legal software suites, digital research, financial accounting and practice manage- ment. However, he says students who are considering law degrees should understand that a law degree is not necessarily a direct career path into the profession. Instead, it should be viewed as providing enhanced educational qualifications akin to an MBA, Hassan says. "The idea that you have to work for a lawyer in order to become a lawyer seems to me to be quite anachronistic, like an 18 th -century concept. And there's no articling jobs, so it's sort of ridiculous for our law society to say that's what See No, page 2 & $#&!&jmmm$cYa[bbWh$Yec ntitled-4 1 12-03-20 10:44 AM www.twitter.com/lawtimes Follow MANAGING CYBERSECURITY RISK Course Leaders: Lisa R. Lifshitz & Peter V. Nguyen Toronto & Webinar | September 27 REGISTER BEFORE AUGUST 24 AND SAVE UP TO $300* Untitled-9 1 2018-08-15 11:57 AM Anver Saloojee says Ryerson University has submitted forms to the provincial Ministry of Training, Colleges and Universities seeking approval of its new law school.